Written by Jon Hazell on 28 November 2013 . 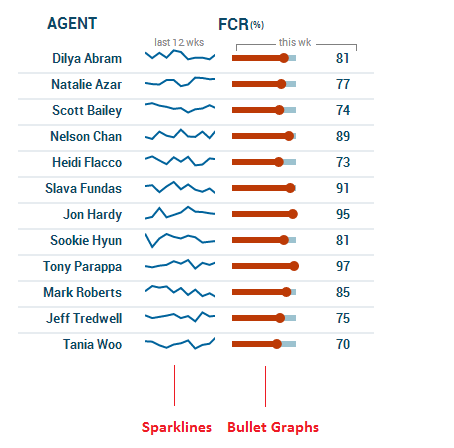 Sparklines, bullet graphs, and state indicators are the “darlings of dashboards”. Data Visualization guru Edward Tufte describes a Sparkline as “data-intense, design-simple, word-sized graphics”. You generally use a sparkline when displaying trends or data over time. Take a look at the example below. What to watch out for: because of the limited space they occupy, it is often difficult to understand scale when looking at sparklines. For instance, if the Y axis doesn’t start at zero then you can end up exaggerating a trend. We call this phenomenon the “lie factor”. When a sparkline is displayed with other ones for comparison, you should ensure they are using the same scale. When they don’t, you should add context to ensure viewers understand the difference. While sparklines are great for adding context by giving a sense of trends, they are not good for making comparisons. The lack of scale makes this hard for the viewer to see, and is better left to a full line chart. 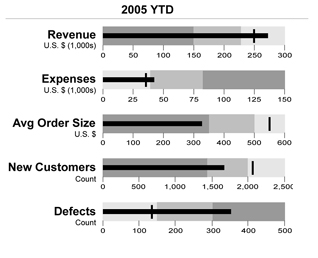 Bullet Graphs are a variation of a bar chart developed by another dataviz guru, Stephen Few. Few developed bullet graphs to overcome the fundamental issues of gauges and meters, as they typically don’t display enough information, require a lot of space, and are cluttered with useless and distracting decoration. The bullet graph features a single, primary measure (ex. current month-to-date revenue or output), compares that measure to one or more other measures to enrich its meaning (ex. a target or threshold), and displays it in the context of qualitative ranges of performance, such as poor, satisfactory, and good. In this example, the order of the sections depicting “good”, “okay”, and “bad” reverse with expenses and defects. If someone is just glancing at the dashboard, they might miss the fact that the defects are far past their target and in the trouble area; they might also erroneously assume expenses are in trouble, if they are only judging by the bar length. A good dashboard should allow you to get an understanding of what is happening with your metrics at just a glance. There are a few ways to rectify this: you can group bullet graphs with the same order together, add indicators or color to identify those places that demand attention, or you could reverse the scale to go from right to left (though this could end up being equally confusing). State indicators are simple visualization elements that provide viewers with a visible cue to draw their attention to a particular area of a dashboard. They can also provide a quick summary of performance or a trend (e.g. using an up arrow to indicate a trend upwards, or performance greater than a previous period). What to watch out for: Never assume that the viewer will automatically understand what a certain indicator means. Use a legend to add context and ensure there is no confusion. There are a few things you want to keep in mind when you’re using indicators; one being the use of color. If you’re using a dominant color throughout your main visualization, use a contrasting one for indicators. And when it comes to choosing your colors, keep in mind that while red typically means stop, bad, or attention needed in western culture, this isn’t true of all cultures. Another point to remember is that approximately eight percent of all men are colorblind; so it’s best to use colors that won’t cause an issue. You can read more on visualizing for the colorblind here. There may be some instances when you want to draw attention to a specific point despite it not being as important as other areas where another indicator already exists. In this case you can use alternate colors, shapes, or sizes of indicators to denote the difference. Why are they so darling to dashaboard dashboard design? Two words: space and time. These visualization elements save both of them. They fit a great deal of data into the space they occupy, and add important contextual information. This means people need only glance at the visualizations to quickly understand what is happening, what needs to be addressed, and/or where they need to take action. And when used together, these “darlings of data viz”, are a powerhouse.